At Ocean's Edge Orthodontics, we pride ourselves on exceptional service before, during, and after your treatment. We love working with you and helping you to achieve a gorgeous smile, improved self-esteem, improved dental health or whatever your orthodontic goals may be. Dr. Murdoch provides a variety of orthodontic treatments to help achieve your goals and will work with you to determine the best plan for you. Children can benefit from an early diagnosis, with monitoring and guidance until treatment in necessary. Anyone can get a great smile with DAMON and DAMON CLEAR braces. The DAMON and DAMON CLEAR Systems use miniature self-ligating brackets that can reduce treatment time when compared to traditional metal braces. We also provide the nearly invisible Invisalign® and Simpli5 system for minor tooth corrections. Contact our Parksville, BC orthodontic office to schedule your complimentary exam. 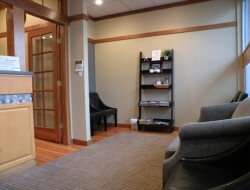 Our friendly staff is looking forward to meeting you and helping you attain your beautiful smile.